makes a very sturdy utility trailer. The no skid textured floor gives better traction when loading your ATV�s or other equipment. There are four D-rings set inside the bed for more load security. 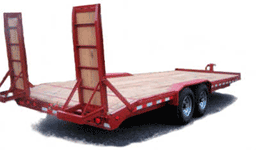 This is the perfect utility trailer for all of your small equipment needs.